In April 2012, Gerard Schmitter was christened as the youngest ship in the CroisiEurope fleet and has been named in honour of the founder. On board this ship you will have many fun experiences to remember. 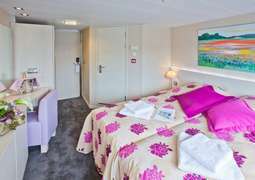 The 88 cabins of the Gerard Schmitter are spacious and complete with stylish furnishings and can accommodate up to 176 passengers. All feature a panoramic window, are outward facing and come with a number of amenities which will help you have the most comfortable journey possible. The food on board this ship is nutritious and delicious, meals are served to a timetable and are guaranteed to be wholesome. The entertainment aboard the ship is unmissable and is composed of a variety of activities depending on what you would prefer. During the day time there is the chance to relax in the lounge chairs out on the Sun Deck, soaking up some rays as the beautiful Rhine scenery passes you by. Evening entertainment includes having some drinks in the lounge with its bar and getting to know the other passengers. Aboard the ship there is a relaxed atmosphere and therefore it is recommended that you wear casual attire during hotter days and pack some comfortable, hardy shoes for the onshore excursions. However for events such as the Gala dinner it is advisable to wear more formal clothing.